Whipping up healthy and balanced meals for hungry and often picky toddlers can be a full-time job in itself, not to mention all the other tasks parents need to accomplish daily. Sprout Baby Food has a solution for days when you just need a break – new yummy toddler entrées that offer complete nutrition via whole grains, beans, veggies and meat with zero hassle. Bonus – these meals are 100% USDA certified organic. Each toddler meal recipe in the new line was created by celeb chef (and dad-of-three) Tyler Florence and each meal is packed with healthy ingredients you’ll feel good about serving your tot. Plus, Sprout is a green company with many eco-conscious practices in place. Keep reading to learn more about these new toddler meals and the company behind them. 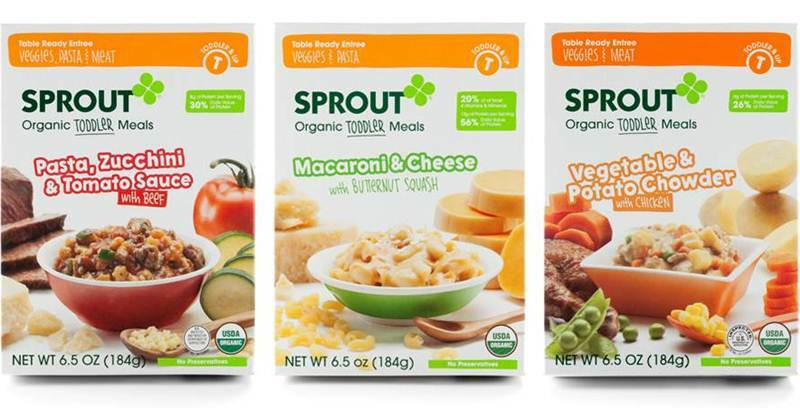 New Sprout Toddler Meals come in a range of flavors like Sweet Potato & Apple Risotto W/Turkey, Macaroni & Cheese W/Butternut Squash, Vegetable & Barley Stew W/Chicken and more. Every one-dish meal offers a variety of ingredients, which are posted at their website and meals includes key protein, vitamin and mineral sources, with textures that are perfect for toddlers who are just learning to use utensils. Each Sprout meal comes in an easy to microwave, BPA-free pouch that’s 100% recyclable. To ensure further recycling, Sprout has partnered with Terracycle, to give used baby food pouches a second life as cute products. Furthermore the company collects all their office paper, plastic, glass and foil for recycling, uses 100% recycled office paper, and all printed materials are on FSC Certified and recycled paper. While of course, you want to cook healthy meals as a family most of the time, once in a while a quick and healthy Sprout microwave meal may be just the thing to save your sanity. Whipping up healthy and balanced meals for hungry and often picky toddlers can be a full-time job in itself, not to mention all the other tasks parents need to accomplish daily. 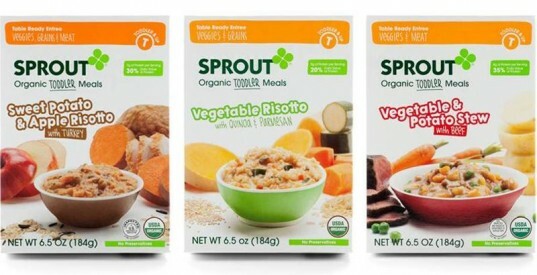 Sprout Baby Food has a solution for days when you just need a break - new�yummy toddler entr�es that offer complete nutrition via whole grains, beans, veggies and meat with zero hassle. Bonus - these meals are 100% USDA certified organic. �Each toddler meal recipe in the new line was created by celeb chef (and dad-of-three) Tyler Florence and each meal is packed with healthy�ingredients you'll feel good about serving your tot. Plus, Sprout is a green company with many eco-conscious�practices in place. Keep reading to learn more about these new toddler meals and the company behind them.